← Spotify Engineer experiences Remote Presence and lives! Wow – when the Xmas season happens, all of the players come out with new toys. 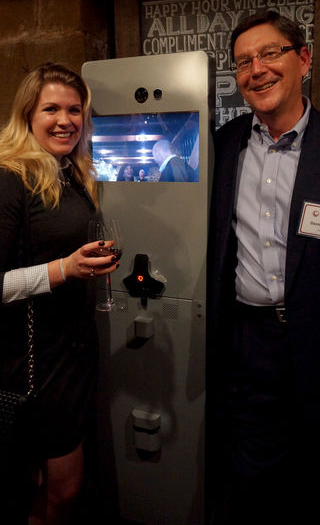 Polycom had their XmasHoliday Event last week and Eliane Fiolet happened to capture a couple of snappys of Anybot’s newest device – the Q(X). We are thrilled to see the team at Anybots are pushing for a platform play (our assumption on the use of the Q-sub-X designation) and hanging on the Anybots Q(X) platform, they have a bunch of the Polycom kit (see the Polycom mic here). Based on the past announcements with Anybots and Cisco, we assume that the Q(X) platform will be configurable with other telepresence video solutions in the near future. The biggest change we see (aside from the loss of the padded headpiece) is the loss of the inverted pendulum concept — it looks like Anybots has gone to a three or four on the floor platform solution – but we wait for further communication for the updates. Further investigation shows that they have retained the inverted pendulum structure as seen via this Wikipedia article entry. From the photos, it looks as if the Anybot team have developed a Windows-based client to handle the video transport and control, successfully removing the transport communication channel from the video transport channel (way to go guys!) which seemed to be part of the problem with the web interface for the QB. The only disappointing aspect of the Q(X) is the unfortunate familiarity to a poorly executed move from the past – Stallone’s Demolition Man and the implementation of the board room devices. Once we get a chance to speak with our friends at Anybots, we hope to have a proper report on the performance ourselves. Enjoy the full article at ubergizmo.com and comment below on your thoughts. 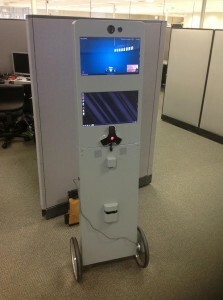 This entry was posted in Anybots, Remote Presence Systems, RPS Companies and tagged Anybots, Anybots Q(X), Polycom. Bookmark the permalink.